Tecan HS 400 Pro Hybridization Microarray Station DNA Genomics Research . New Life Scientific, Inc. 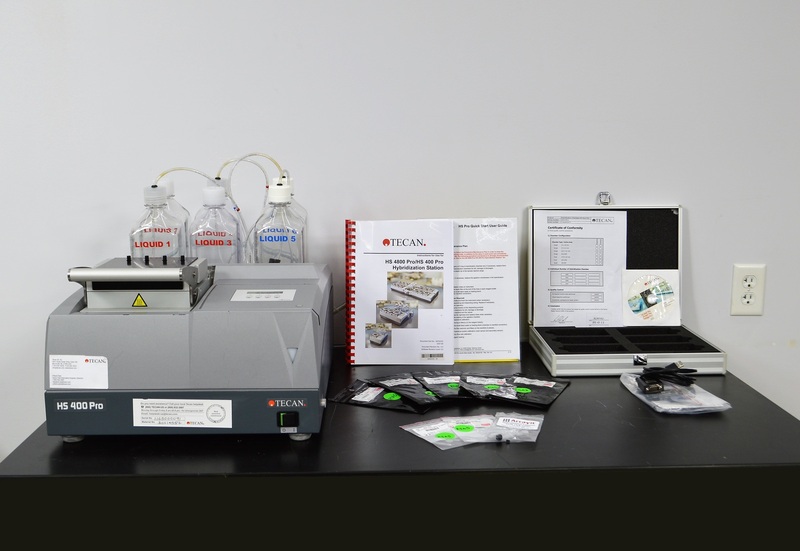 The Tecan 400 HS Pro is a hybridization station for multiple microarray slides per automated cycle. The Pro performs pre-hybridization, denaturation, and drying on microarrays that are used in proteomic and genomic research. The Tecan HS Pro is in good cosmetic condition and includes a number of accessories and consumables. These consumables may not be the full quantity labeled on the package or might have 'expired' according to the manufacturer's dating. The included items are in good condition, but there are signs of cosmetic wear and age. This ad does not include a PC workstation; however, please inquire about a dedicated PC to complete your system. New Life Scientific technicians evaluated the communications and power cabling, prior to powering the instrument. The included HS Pro Control Manager v. 4.1 software controls the instrument only and the CD will be provided, allowing the user to load it to their established PC. The customer is responsible for adhering to any and all licensing policies set forth by the manufacturer. During testing, hybridization station communicated with the software (PC not included), the pumps and chambers function, but the end-user will need to supply a waste vessel.